Parivadini hosts its annual music series from Nov. 30 to Dec. 3, 2017. 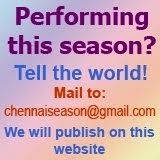 Venue: Ragasudha Hall, Luz Avenue, Mylapore. 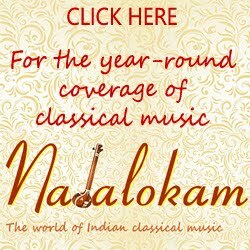 4.00 p.m. - Nagasvaram Concert by Thirumayilai Karthikeyan. 5.00 p.m. - T.N.S.Krishna (Vocal), B.U.Ganesh Prasad (Violin), Vijay Natesan (Mridangam), Sree Sundarkumar (Kanjira) - 4 Hours concert.